The area which I live in is slowly getting better about having food other than pizza as dining options. We live in a college town so the majority of food involves a meal with fries or pizza, lots and lots of pizza. Since I eat gluten free pizza doesn't hold the same appeal as it did before my diagnosis. When I first moved and met my husband their were only a few ethnic restaurants and almost all of them were Mexican food. I quickly learned that I was going to have to learn to cook as many things as I could at home or be stuck with the frozen ethnic aisle (which is never great) at our local grocery store. So I bought a ton of cookbooks and failed at making a lot of dishes. However, I kept trying and talking to friends about the dishes that they grew up making in their various households and I learned that with practice all food is doable. Now I look at recipes for the flavors and feel confident that I can make a large variety of foods. Tonight I tried a new recipe for Tomato Yogurt Chicken Curry from the October 2012 issue of the Food Network Magazine. This recipe has 18 ingredients. It takes 1 hour 15 minutes of total time, all of which is active and makes 4 to 6 servings. I made a few modifications to this recipe. Since I was cooking for my kids (and I have never actually seen them at our local stores) I left out the dried arbol chiles. 14.5 ounce cans of whole tomatoes are another rarity in my area so I bought a 28 ounce can and weighed out the needed amount of tomatoes and liquid. I had leftover baby red potatoes from another recipes so I cut them into fourths and used approximately 10 of them for this recipe. Finally I used 2 percent Greek yogurt not whole since it was what I already had in the fridge. Using a dutch oven really does make this recipe easier to make. If you haven't already bought a dutch oven they are a great kitchen tool and make it much easier to make soups, stews and curries. Based on my family I would say that this recipe serves 4 people. If you want a larger amount or leftovers I would suggest doubling the recipe. Overall this was a nice basic Indian curry recipe that can be adjusted to suit your desired spiciness level. For the recipe go to Tomato Yogurt Chicken Curry. love this... spicy and yummy! Thanks :) I love spicy foods! I have been looking for a new curry to try. Thanks for posting this! If you end up making it tell me how it turns out! Oooh, yum! It would definitely give me heartburn, but it sounds like it would be totally worth it. Oh wow this looks so delicious!!! Will have to try it! Visiting from Doing You Well link up!! Thanks :) It really is yummy! Thanks for stopping by sophandlulu.com! 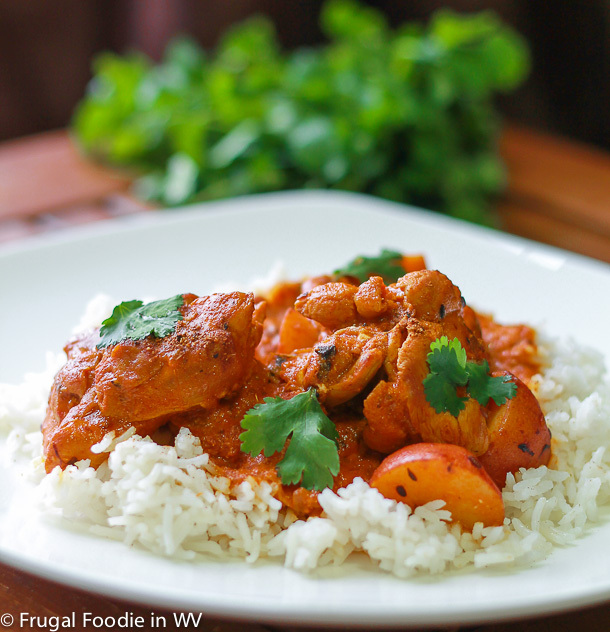 I just had curry chicken the other night, but this Yogurt Chicken Curry looks d-lish! I started subscribing, and look forward seeing more of your unique recipes in the future! I eat chicken curry pretty frequently, it's one of my favorites! I am visiting with Doing Well Blog Hop. You are certainly doing well at cooking. Yummy! I am already a follower so just saying Hi, and love your posts. You're sweet, thanks for the comments and for stopping by! I am just now trying Indian Food. Like you, I wasn't always able to find it. This recipe looks really good and I like the combination of ingredients. I like the spices and flavors of Indian food. Curry has a great taste and smell. This looks delicious.